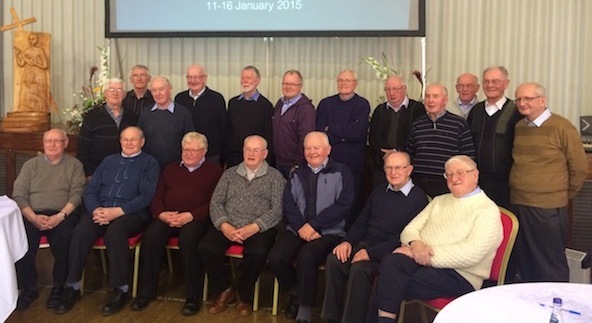 Just some of the thirty two Redemptorists who celebrated Jubilees in this past year. Tonight in the Redemptorist house at Marianella, Dublin, we celebrated Jubilees for twenty one Redemptorists present, and eleven other Redemptorists not present. A great night, a joyful night, and one of immense thanksgiving. All had their Jubilees, of Ordination or of Profession as Redemptorists, in the past year or so. And so, as Irish Redemptorists spend this week in Chapter, reviewing our lives and ministries, we took the chance to celebrate these brothers of ours. Three Redemptoristine Sisters joined us for the Mass and meal. One, Fr. 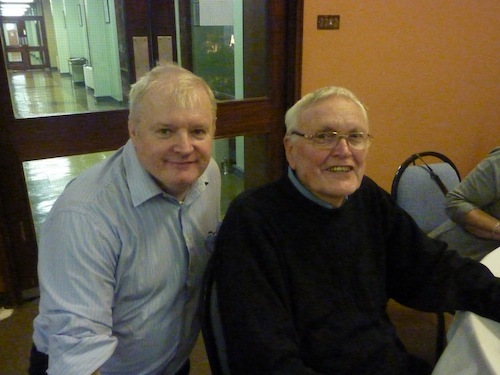 Cathal Cumiskey, celebrated 60 years as a priest.Eight celebrated 50 years of priesthood, four 40 years, and two twenty-five years of priesthood. Others celebrated the anniversary of taking their vows as Redemptorists, -their Profession as Redemptorists. Nine celebrated 60 years of Redemptorist life, six celebrated 50 years, two 40 years of Profession. These men, from different corners of Ireland, have lived lives ‘poured out’, lives ‘given for you’ like Jesus in the Eucharist. And they have lived their lives, as priest or brother, ‘not with any trumpet love’. The late Karl Rahner, Jesuit, was once asked why he remained a priest. He replied: ‘I became a priest because of priests I knew: I remain a priest because of priests I know.’ That was how I felt, this evening. Proud to be part of such a group, grateful for their witness of commitment, joy, dedication, lives poured out ‘not with any trumpet love’. of the Gospel. The radiance on the faces of so many of us was something to behold. An evening of being immensely thankful to God, who called them, inspired them, walked the roads of the Philippines, or Brazil, or Nigeria, or Siberia,- or Ireland. It was a night for saying a mighty ‘DEO GRATIAS!’. A night for being mightily thankful for my own vocation of being a Redemptorist. Earlier in the day, we had a report from Fr. Michael Dempsey, who is home from our new mission in Mozambique, begun in 2012. I’ll put a separate report up about that new mission, and with Michael’s report on it. The Irish Redemptorists are definitely ‘open for business’! It was a joy for all of us, to hear about this new seedling, this new ‘acorn’ in Africa, in a parish that is larger than Ireland, in a region of Africa where 15million people speak Chechewa, and where our missionaries are learning the language as they go. Would I love to go, if I was younger? Sure would! But it’s up to younger men, already with us, or yet to come and work and live with us. May the Lord bless them mightily! ← Death of Mrs. Phil O’Rourke. Can you help me locate Fr. Dermot O Conor? The email he gave me last year has failed. I would appreciate any help you can give me. Email address, phone no. and/or Mail address. Thank you so very much.